To celebrate the release of Tom HIddleston’s new film I Saw The Light (in cinemas now), we’re giving you the chance to win a film poster signed by the man himself, and a copy of the Hank Williams biography on which the film is based! 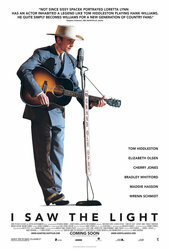 I Saw The Light tells the story of the iconic, tormented singer-songwriter Hank Williams who revolutionized country music with his raw charisma, haunting voice and original songs, most of which are considered American standards today and have been recorded many times over by pop, rock and country artists alike. Hank Williams (Tom Hiddleston) emerged from the local Alabama music scene after World War II. Wife Audrey (Elizabeth Olsen) was desperate to sing by his side despite being of lesser talent, which fueled an extremely turbulent home life. But Williams’ ability to write songs covering a wide range of emotions, using his own personal troubles as inspiration, became the essence of country music. In the end, he realized his dreams: hit records, a place on Nashville’s prestigious stage and radio show the Grand Ole Opry and even guest spots on the then-new medium of TV. To be in with a chance to winning, all you have to do is answer the question below. The competition closes at 23.59 (GMT) on Thursday 19th May 2016.